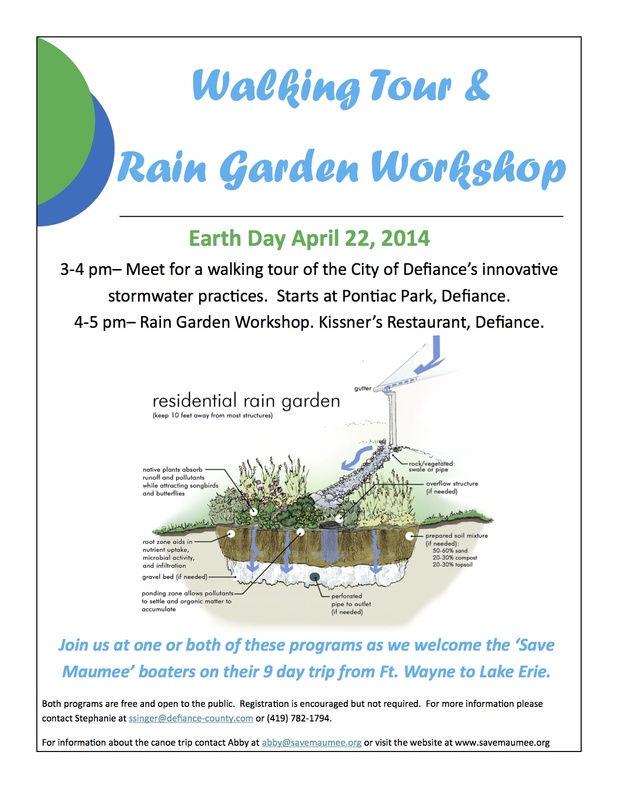 Join us for an urban stormwater walking tour, an update on the Upper Maumee River Watershed Management Plan and a rain garden workshop! On April 22, 2014, the City of Defiance will be receiving some special guests from upriver! Save Maumee, a group based out of Ft. Wayne, IN will be stopping in Defiance during their 9 day canoe trip from Ft. Wayne to Lake Erie! One of the goals of the trip is to raise awareness of water quality issues and recreational opportunities of the Maumee River. Join us in welcoming them and learning about ways to benefit our waters! At 3:00 pm, we will hold a walking tour to view some of the innovative ways that the City of Defiance is reducing stormwater runoff from polluting the rivers. The tour will be led by Jen English, City of Defiance MS4 Coordinator and will begin at Pontiac Park. We will be seeing an example of porous pavement, a rain garden (under construction) at Defiance Library, the Auglaize Riverbank stabilization project, a rain garden at City Hall, and bioswales on Perry Street. From 4-5:30 pm, we will be holding a Rain Garden workshop and giving an update on the Upper Maumee River Watershed Management Plan at Kissner’s Restaurant (upstairs). Sharon Partridge, Watershed Program Manager, will give a brief presentation on the new Upper Maumee River Watershed Management Plan and how it benefits the community. Then Martha Bishop- Ferguson will conduct a rain garden workshop. Martha is the owner of Riverview Nursery and has grown native plants for 25 years. She is an advanced Master Gardener and a Master Naturalist who previously directed the garden restoration project at the Gene Stratton-Porter State Historic Site. She will be detailing ways that homeowners can install a rain garden in their yard. A rain garden is a landscaped area planted with native plants and flowers that soak up rainwater. The garden fills with a few inches of rain water that come off of the roof of a house or building during a storm. After the storm, the water slowly soaks into the ground instead of running off the land into a storm sewer or waterway. Compared with a grassed lawn area, a rain garden may allow 30% more water to be absorbed. Native plants are suggested for use in the rain garden because of their deep roots, water uptake and their ability to tolerate conditions ranging from wet to dry and hot to freezing. The events are sponsored by the City of Defiance, the Defiance County Soil and Water Conservation District, the Upper Maumee River Partnership and the Upper Maumee Watershed Management Plan Clean Water Grant. These programs are free and open to the public. Registration is encouraged but not required. For more information please contact Stephanie Singer at ssinger@defiance-county.com or (419) 782-1794.